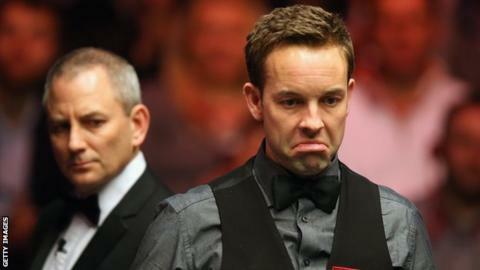 Ali Carter has revealed his consultant wants him to have surgery to ease his Crohn's disease, an illness he was first diagnosed with as a teenager. Carter, who has been given the all-clear from testicular and lung cancer, is now following a strict diet. "It was only [last week] I went to see my consultant and she said she wants me to see a surgeon and have an operation which I can't afford to do," he said. "I've been struggling with it, so it's a drastic measure this diet." The 36-year-old from Essex, speaking after beating Tom Ford in the second round of the World Grand Prix in Llandudno, said his diet "would even be too strict for (vegan) Peter Ebdon to do". He continued: "Believe me it's depressing - it's a sort of healing diet. It (Crohn's) is something I've always had to deal with and deal with it I will." The former world number two and two-time World Championship runner-up is currently ranked 32 in the world. "I've been through a lot but now that's behind me so you're quick to forget about that," he added. "I just want to live a normal life and be healthy like every other snooker player on the tour and if I can do that I'll probably get a lot more results. "But unfortunately the old Crohn's won't leave me alone at the minute, so I've got to try to tackle it once and for all."